This is part 2 of the The Guillotine at Work, containing documentation of the Bolshevik "Red Terror" in the wake of the Russian revolution, edited by Russian anarchist Gregori Maximov. The photo above is a still from a propaganda film commissioned by the OGPU (Soviet Secret Police) and made in 1927–1928. 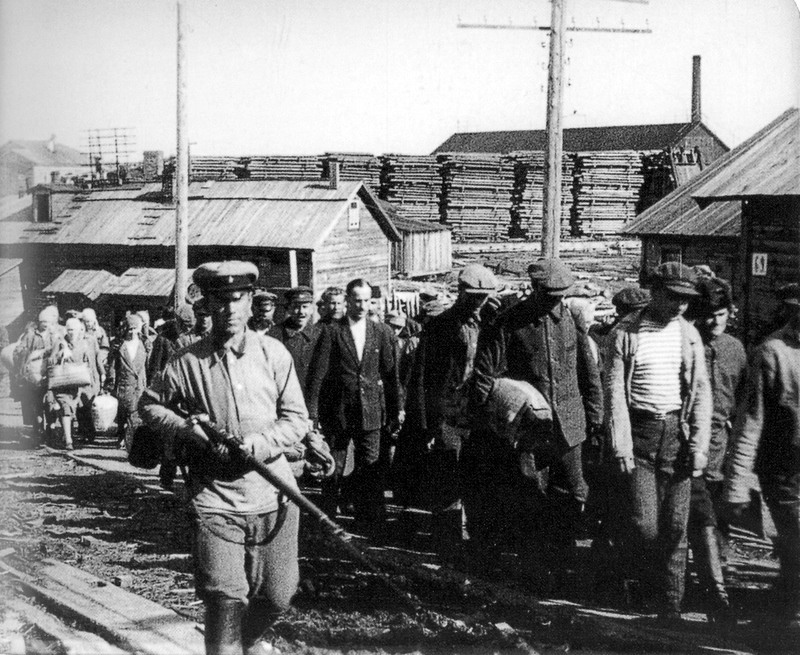 [See http://rutube.ru/video/01c177d87d4386c576c4e296e602596e/] This documentary was produced in response to the international campaign against the treatment of prisoners in the USSR, including anarchist prisoners. Despite the fact that it greatly embellished the living conditions of prisoners, it is impossible to avoid the oppressive experience shown of extreme poverty and crowding, frightened people toiling, and armed guards grinning . Hey, thanks so much for posting this, it's great! Here is some data in the form of an index. NB you will find place and personal names vary (different transcription systems) - also, some of the entries may be for pages in part one. But hopefully you will find it useful. Tab separated text. 'Bio' indicates page has something - however brief - biographical about them. Pavlov, the Moscow anarchist baker is listed as having a photo at page 341, but no photos in the PDF. Have you got a copy of the photo, as I am doing some research on him.? See http://postimg.org/image/scv2j6qst/. This photo of Kropotkin's funeral committee can be found in a number of places on the internet.